This post first appeared as an agency guest post on Jason Fall’s Social Media Explorer blog. You can see it here. The field of public relations has undergone two major revolutions in the past 15 years or so. The advent of the Internet represents the first revolution. This revolution primarily impacted the way content was created, distributed and consumed. It also fundamentally changed the nature of communication – remember email became the first killer app of the Internet revolution. The second revolution is social networks. Again content creation was impacted, led by consumer generated content in multiple forms. Perhaps more importantly, peer-to-peer communication between consumers, and two-way communication between consumers and brands/companies, have been enabled and are having a profound impact on the way companies are organized and behave. The worlds of marketing and public relations have made an analog to digital conversion. And with it, we are in the midst of the digitization research and measurement. Communication models are a linear representation of how a communication process works and are important in providing a framework for evaluation and measurement. The Outputs – Outtakes – Outcomes communication model often used in public relations today has two primary deficiencies in the era of digitization and social networks – clarity and relevance. Clarity: The model is difficult for many to understand and apply. Public relations practitioners regularly get Outputs confused with Outtakes or Outcomes. Outtakes are not often used in the U.S. – they seem much more prevalent in Europe. The overall taxonomy can be confusing and is defined in different ways by different practitioners or organizations. Further compounding the confusion is the fact audiences we present our results to rarely understand the terms and have trouble relating to them. In short, the terms are too much ‘inside baseball’. Relevance: The model was developed when communication was media-centric. Digitization, consumer-generated content and social networks have shifted communication from a media-centric world to a content-centric world. How receivers of communication engage and are influenced by content has fundamentally changed. What is needed is a metrics taxonomy that is easier to explain, understand and apply. Ideally one that is applicable for traditional and social media. Here is the model we apply at Fleishman Hillard. 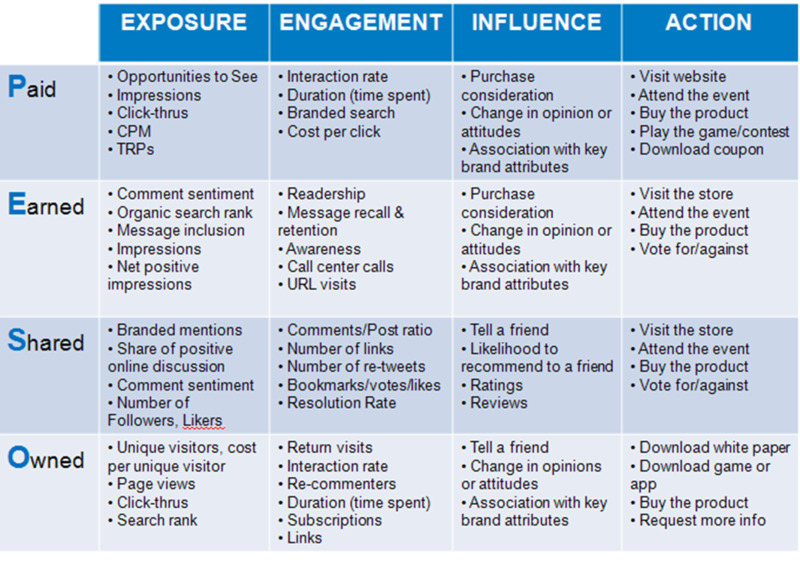 With the new model comes new metrics primarily driven by social media/networks. Exposure includes traditional metrics like Impressions and Message Delivery, and digital metrics like Search Rank, Twitter Reach and Average Daily Visitors. Engagement includes traditional metrics like Readership, but adds new metrics like Subscriptions, Repeat Visitors and Follower Mention %. Influence in the model refers to influence of the target audience, not who has influence in social networks. Influence metrics range from increases in Brand Consideration to changes in attitudes and opinions to changes in online click behavior. Action metrics can range from event attendance to voting for/against legislation to buying a product. Public relations research and measurement has historically been driven by content analysis. As content increasingly became available in digital form, the techniques of research and measurement didn’t change so much as the way content was aggregated and delivered for analysis. Then web-based platforms became available from a variety of vendors to digitize and automate content analysis while the metrics being measured – article counts, impressions, message uptake and sentiment for example – basically remained constant with previous, more manual, methods. Today, the digitization of research and measurement has broadened from this predominately singular focus to include data and interactions from three distinct regions or zones of research and measurement as shown in the figure below. As company websites, e-Commerce sites and other forms of ‘owned’ media proliferated, web analytics software provided an explosion of data and new metrics like unique visitors, page views, click through rates, duration, referring sites and conversions become widely used and reported. We became over-served with data and underserved with insight. The exponential rise in popularity of social networks in the last five years raised the bar again and presented new challenges in digital research and measurement. Now we were faced with measuring conversations and not just clicks. Measuring engagement became more important than measuring eyeballs. The frontier in social media measurement is evolving toward measuring both the conversations and behavior patterns occurring within social networks, and understanding and connecting the underlying influences and motivations for the online behavior. The third area of interest is in all the real-world, offline interactions and transactions. Scan and other digital sales data is important to understanding, tracking and connecting online and offline behavior and actions. Connecting mobile transactions, online and offline behavior and WOM is a significant challenge. Although we have attempted to define three distinct ‘zones’ of digital research and measurement necessary to address the full spectrum of social media and marketing impact, a robust measurement strategy should take a holistic, integrated approach using methodologies, tools, data and metrics from all three zones. The goal is to be able to track the behavior, interactions and transactions of individuals across all three zones, across multiple platforms and physical locations, understanding how online behavior impacts offline behavior and vice-versa. The enhanced scope and integration represented by the PESO model drives a corresponding broadening and need for integration in digital research and measurement. One can easily find themselves attempting to measure a highly integrated program that includes the awareness created with paid media, the relevance and information delivered via owned, the credibility delivered by earned media and measuring the conversations and interactions occurring in shared media. Just from a metrics perspective, the PESO model requires a significant broadening in thinking as shown in the matrix below. Digitization has changed what we need to research and measure, where we find data and how we perform analysis. The future will bring more data, better tools and improved methodologies. Sifting insights from the mounds of data will remain a major challenge. The intersection of marketing, privacy concerns and research must be navigated. The constant in all the change brought by digitization is who – human analysts and research. Discovery and insight, like it was 15 years ago, remains fundamentally a human process. It remains the analog constant in a world of digitization.